It finds its way through the cracks. Through fissures in the walls we set up against the suffering of strangers. Because there is so much sorrow in the world, we can't feel a tiny fraction of it. We can't, and wouldn't want to if we could. Lest we surrender the happiness that we should cherish. Before it is our turn. Like water, grief has odd currents, eddies, backflows. When I heard of the 15 young Canadians, 10 junior league hockey players and five support staff, who died Sunday in a bus accident in Saskatchewan, my thoughts were distant. Those poor boys, those poor families. That was about it. On Tuesday I read the story in the New York Times, about the identities, switched for two players in the carnage and commotion—one who had been thought dead was alive, one who was thought alive, actually dead. Also unimaginable, yet somehow speaking to the human condition more than the accident itself. For we never know if we are among the safe, for now, or the taken, today, and even knowing, we don't know. We only think we know. Those boys and their families thought they knew, on Saturday. On Sunday they were proven wrong. Then a Canadian friend sent me a stark photo he had taken, of a borrowed hockey stick placed outside his door. Somehow, that stark photo. The lonely stick. 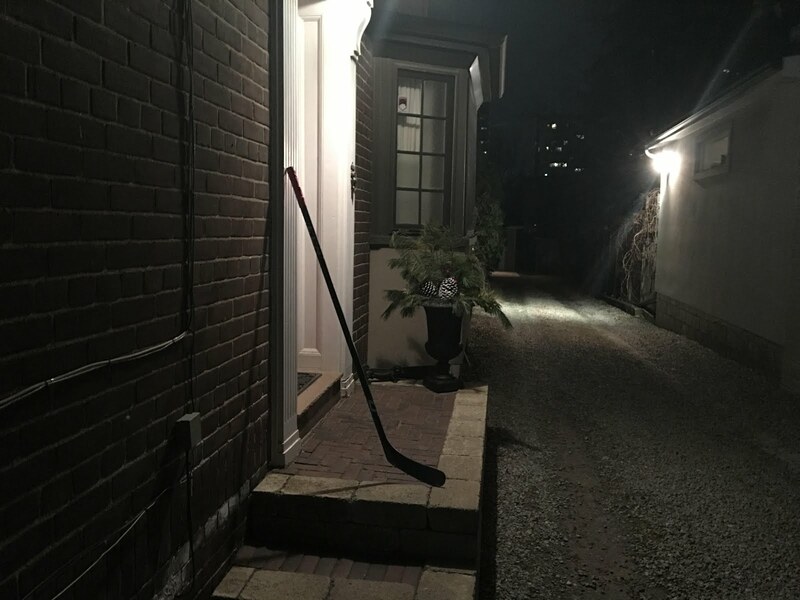 Canadians love hockey, and they have taken to putting the sticks outside their doors, to acknowledge the loss, to show solidarity for their fellow citizens' suffering, and in the sweetly impossible thought that one of the lost players might need a stick, as players often do. It isn't much. It's an enormous amount, in that it's all that can be done, and a reminder that like it or not, we all all part of something, something larger, the great human condition, that feels, each in our turn, love, and connection, each in our turn loss, and sorrow. It is difficult and necessary to bend your mind toward the tragedy of others, to recognize it, solemnize it, pause from the revelry of our lives to acknowledge the woe in theirs. To let ourselves be forced against our wills to do it. For whom? For ourselves, as much as for them. Or rather, for all of us, for our frayed humanity, so warn and twisted and threadbare. No words suffice; better a mute hockey stick, placed outside the grieving doors of Canada. The Perfect Tribute. Wonderful piece Neil. It is too easy to not see grief, yet being blind to it is worse.